With the explosion of new trainer apps over the last few years, many of us are running apps on numerous platforms – from iOS to Android to Windows. Not to mention numerous form factors such as tablets, phones, and desktops. All of which leaves everyone trying to figure out how exactly to get these apps from the small screens they’re usually running on– to something a wee bit more appropriately sized for the many hours we’ll sit on the trainers this winter staring at them. This is your end to end guide on how to do exactly that. Virtually every trainer app out there today falls into one of these platforms. From there, you need only decide whether you want a wired or wireless solution. I suspect that many here might find that things are quite a bit easier (or cheaper) than they expected to get from that small screen up to the big-screen TV. As for the apps themselves, check out my guide from last year. Most haven’t actually changed that appreciably since then, though I am working to update it. But I’m trying to balance that massive lift of creating new screenshots, wordy sections, etc… vs other new product reviews at the moment. Finally, note that for this post I’m primarily focusing on the easiest and most mainstream options (except where non-obvious solutions are cheap and easy). As is often the case in technology, there are numerous ways you can get from point A to point B. The ease of those solutions though will heavily vary on one’s geek-factor. This is especially true on Android, Mac, and Windows platforms. Feel free to list alternatives in the comments below, but I just wanted to give some perspective on how I selected what I did. 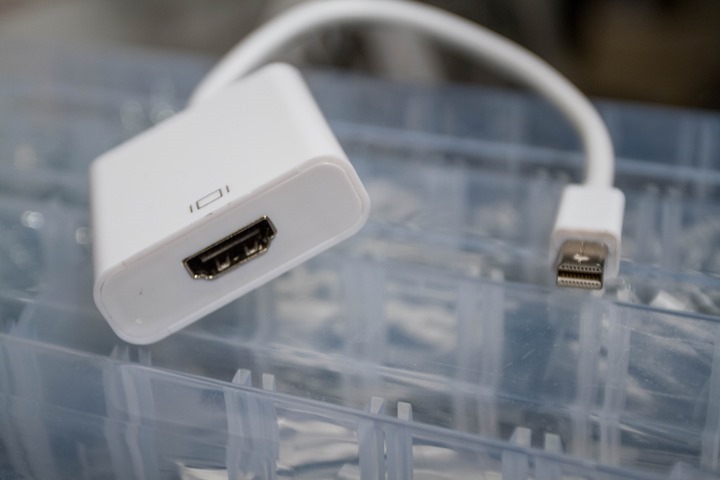 Wired: In this case you’ll pickup an HDMI adapter that will connect via either the Lightning or 30-pin port on your iOS device. You can get all sorts of lengths of HDMI cables, as well as adapters if you have older/other plug types. I just use these 3m (9ft) long HDMI cables from Amazon Basics to connect to my TV. If you plug-in via the wired adapter, it’ll automatically show on the screen, so there’s pretty much nothing to do – it just happens magically. Wireless: If you want to go sans-wires you can do so with Apple Airplay and an Apple TV. The Apple TV is a small box (just $69 these days) that allows all sorts of other streaming goodness (i.e. Hulu, Netflix, iTunes, etc…). In this case your iPhone/iPad display is typically mirrored onto your TV, however some apps can also show a separate screen so you can have basically two different things shown – one on your iPad and the other on the big screen TV (called Dual Screen). If you’re going via the wireless method with Apple TV, then you’ll need to tell the iPad/iPhone to mirror, just simply swipe up from the bottom of the screen and you’ll see the ‘Airplay’ option. One minor note is that you’ll need to obviously be on the same network for this to work (i.e. same WiFi network). Here’s the full instructions as well. Finally, note that you can use Chromecast to mirror some apps from your iOS device to a Chromecast display adapter, however I’m not aware of any trainer apps that support it at this time on iOS. Next up, a Mac. When it comes to this you’ve got fairly similar options as the iOS devices, including both a wireless and wired option. Wired: In this scenario you’ll pickup an HDMI adapter that will connect via the Mini Display port, or USB-C adapter (newer Macs). Some also just simply have an HDMI port already, in which case you’re good to go. You can get all sorts of lengths of HDMI cables, as well as adapters if you have older/other plug types. I just use these 3m (9ft) long HDMI cables from Amazon Basics. Note that depending on how old your Mac is, you’ll want to check out this post to validate if it carries with it audio by default. Note that you’ll want to carefully study whether or not your Mac has a Thunderbolt or Mini Display Port. There are very subtle differences there that might cause you issues if you don’t get precisely the right cable. Wireless: If you want to go sans-wires you can do so with Apple Airplay and an Apple TV. The Apple TV is a small box (just $69 these days) that allows all sorts of other streaming goodness (i.e. Hulu, Netflix, iTunes, etc…). 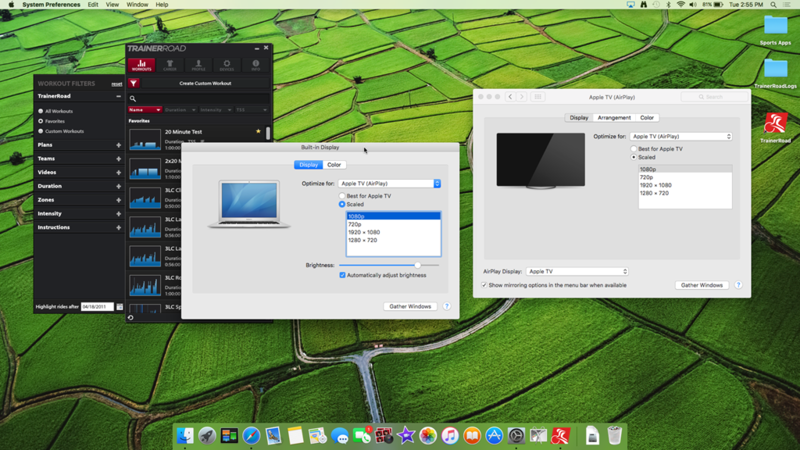 In this case your Mac display is typically mirrored onto your TV, however you can also configure the Apple TV to simply display to act as a secondary screen altogether and then just drag that application to the Apple TV. 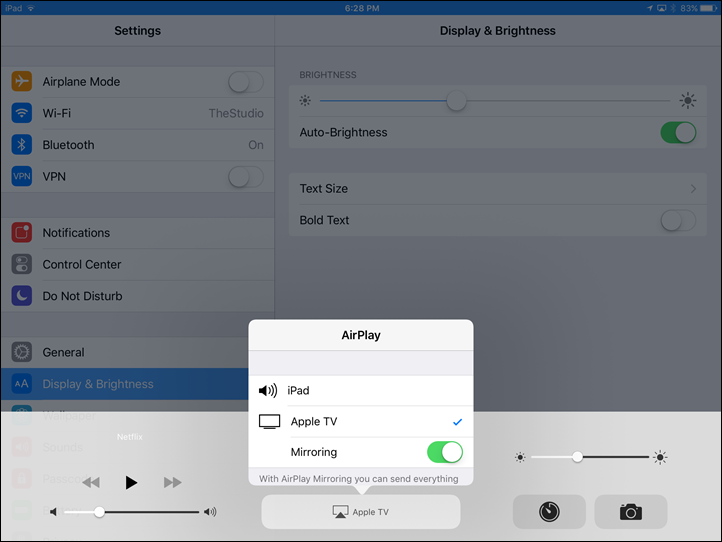 If you’re going via the wireless method with Apple TV, then you’ll simply select Airplay from the upper right corner of your screen and choose/tweak any resolution options you want. One minor note is that you’ll need to be on the same network for this to work (i.e. same WiFi network). Shouldn’t be an issue for most, but just noting it. Finally, note that you can use Chromecast to mirror some apps from your Mac to a Chromecast display adapter, in that configuration you simply specify a given window to display on Chromecast. 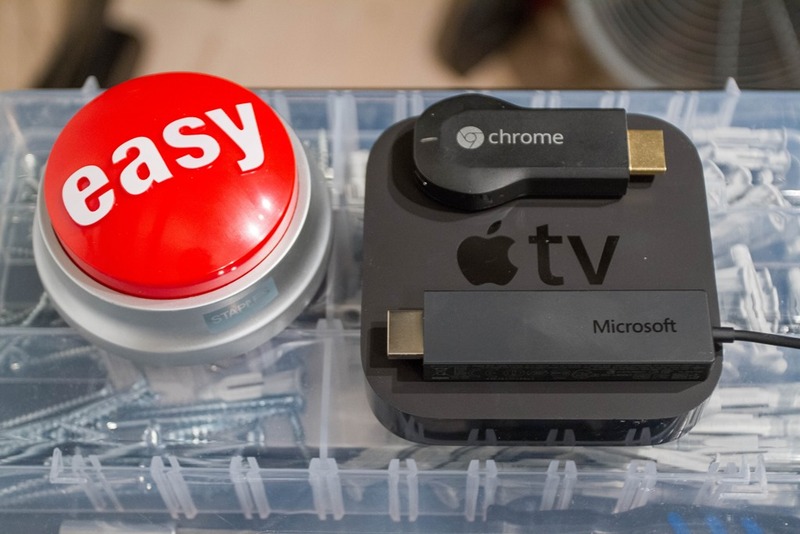 Chromecast is handy in that it’s about half as much as Apple TV. 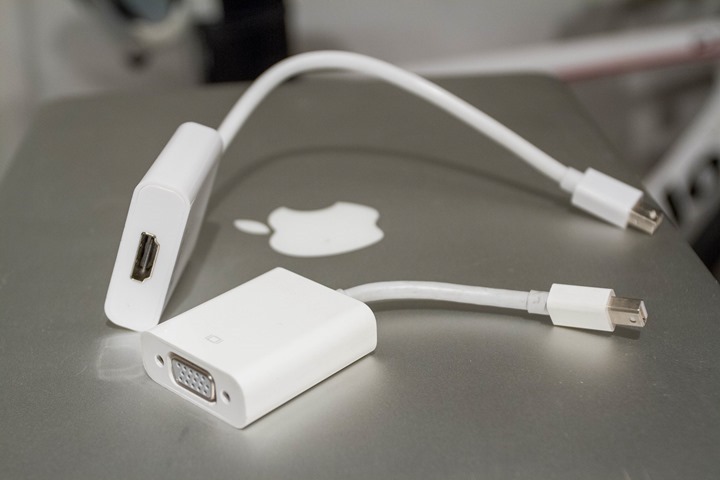 Wired: This will vary a little bit, but in the vast majority of cases you’re going to use a micro-USB to HDMI adapter. These cables are cheap, and cost about $6-8 (this one is nifty because it also enables you to charge your Android device too). Some Android tablets also contain a micro-HDMI port, in which case you’ll need a micro-HDMI to HDMI cable, also cheap. This is slightly more desirable than the micro-USB option, because it doesn’t block the charging/USB port. Wireless: This is by far the cheapest and easiest wireless connectivity option out of everything on this page. All you need is virtually any Android device from the past few years, along with Google Chromecast, which costs about $35. This allows you to quickly simply mirror your screen, or a portion of it – direct to your TV. 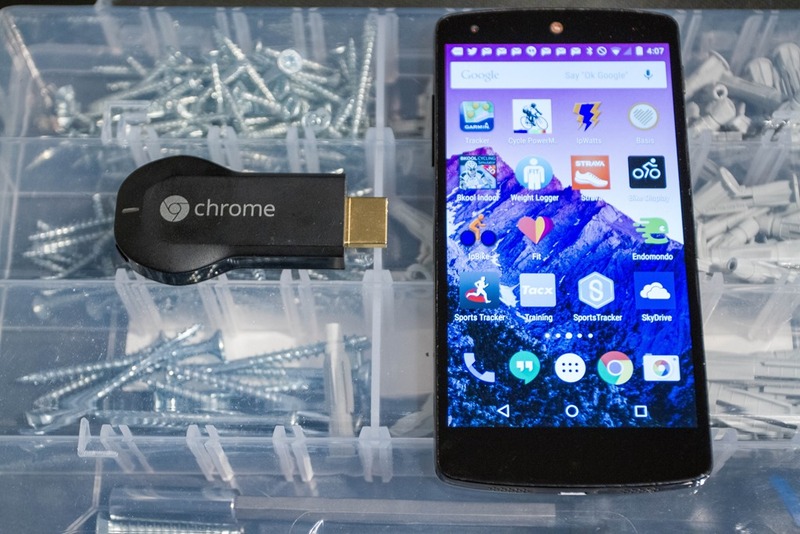 The Chromecast adapter is sorta like an oversized USB thumb drive, but with an HDMI connector instead. It also comes with a small extender-adapter in case your TV is a bit tight on space. 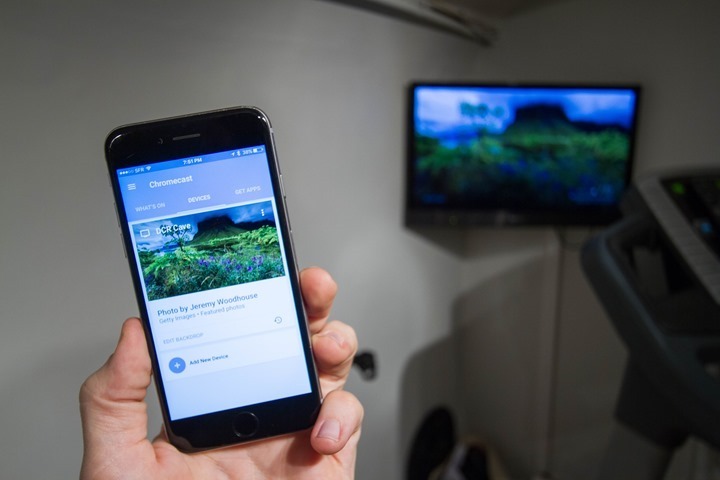 Now Chromecast is fairly versatile, and there are many solutions out there on the interwebs to make it work for a host of platforms. For example, you can use it to ‘cast’ your entire PC screen to the display. Also works for Mac too. And again, at $35, it’s the cheapest option there is for wireless display unless your TV already supports wireless broadcasting. Finally, note that Miracast (I talk about that more in the Windows sections) is supported natively on Android 4.4.2 and later. So that’s one option that’s potentially free for compatible TV’s. So you’re using a trainer app that’s designed for a Windows PC? Examples would be Trainer Road, Zwift, PerfPro, and many others. No worries, there’s plenty of options here. Wired: Depending on how old your PC is (and your TV), you’ve got a host of options. Most newer Windows laptops will have a mini-display port on them. The right side of the below cable is the mini-display port, while the left side is the HDMI port. Meanwhile, many tablet style devices (i.e. Surface RT) have a micro-HDMI display port on them. And others yet use mini-Display Port (such as other Surface units). For this you’ll need a cable that connects to HDMI on your TV. In order to make it easy to figure out cables when I’m fishing behind a TV, I often label some of the less-obvious ones with a simple tag of paper and a piece of tape. Finally, if you’ve got a desktop, then you’re probably looking at either a VGA, DVI, or HDMI adapter. VGA is a little less common on TV’s than HDMI, and DVI is even less common on TV’s. 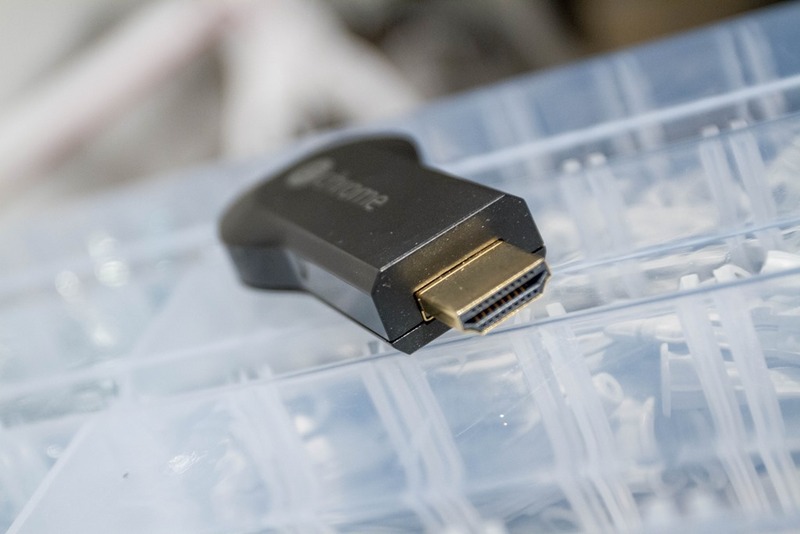 HDMI is your best overall option, because it’ll seamlessly include sound as well as video. Whereas with VGA you’ll have to get yet another cable for that. But sometimes if you’ve got some random larger PC screen floating around, it’ll be VGA or DVI. Wireless: There’s so many ways of doing this, that I’m just going to focus on the easiest. If you’re more geeky, then you can implement varying degrees of geeky solutions. 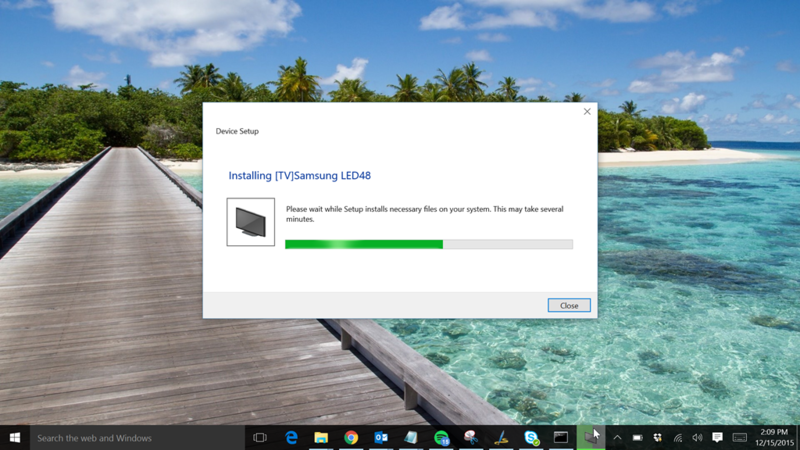 What you’ll need to ensure that is that all your devices (PC and TV) are fairly new and updated, mostly though that your TV is new enough to be connected via WiFi or has WiFi capabilities. Else, you can get adapters to help connect all the pieces together. The display device: Your TV, projector, or other big screen on a wall. 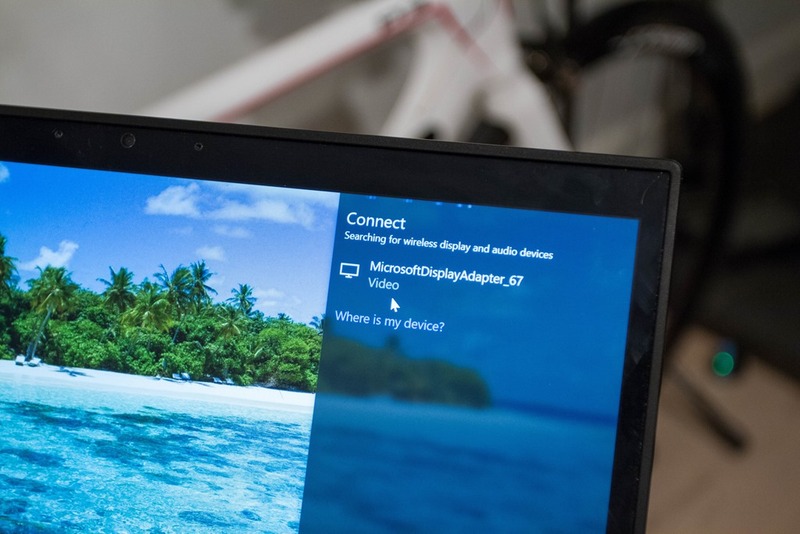 You can use Windows 8.1 & Windows 10 with Miracast, and then connect and then broadcast to a compatible Miracast display device (here’s the official listing of supported units). Unfortunately in the studio, I had no such newer TV’s. However, at my house my relatively new TV did support it. This supports both audio and video. I’ve only used the Microsoft Wireless Display (Miracast) adapter, which is silly-simple to use – and only about $45. You simply plug it into the back of your TV, and then from there just select it from your computer. I find this also great when I’m travelling and want to watch something like Hulu or iTunes on a hotel TV, since I can just plug it in easily. Finally, you can also use Chromecast too/instead. There’s pros and cons to using that over Miracast. The pro to Chromecast is that it also does other streaming pieces, whereas with Miracast it’s just acting like a secondary monitor. Meanwhile, if your TV already has Miracast, then there’s no reason to buy another adapter just to stream it. 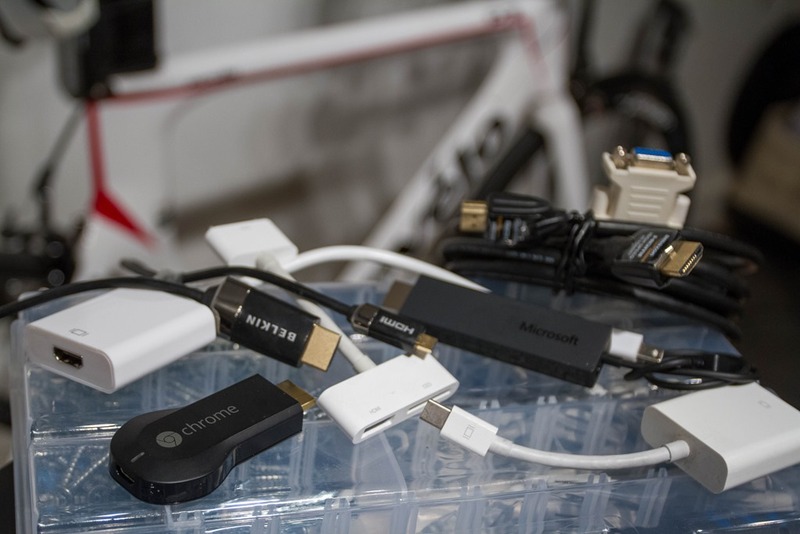 From Android: I rarely use this combo for trainer apps, but when I do, it’s just Chromecast. As you can see, I kinda keep it simple. Like I said at the beginning – anytime you want to play integrator in the tech world, there are a lot of ways to skin the cat. But for me, I generally want the easiest/quickest solution that requires the least upkeep. I find that when it comes to trainer time – I don’t want to be screwing around wasting time with something that’s jury-rigged up. I’d rather be riding! With that – go forth and enjoy a bigger screen! Great timing with this post! I’m just evaluating the options. What’s your experience on delay of the video on the big screen when you’re broadcasting from iPhone/iPad via Apple TV videos of virtual rides? I’m thinking of the video rides in Virtual Training. This is the method I use and as long as you get a good WIFI connexion both from the ipad and apple tv or one or both are wired (my Apple TV is wired to the router) – then close to non. This is a great option for many things ! Kids enjoy it also. When do you plan to post the app review? Winter has already started and we are all wating for your invaluable point of view. Are you considering to initiate a forum section? I don’t have a specific timeframe for the app review. I started updating the tables and backend data already, and some of the sections. To be totally honest, had I realized what a massive lift it would become last year – I probably never would have done it. It’s turned into a huge production trying to get all my own screenshots for each app (which means I need to install/use/etc each app) and then also validating all of the updates each app has done since then. Not to mention writing something new for each one. There are approximately 20 apps today that I ‘cover’. And the ‘conundrum’ is that by and large, these apps mostly do whatever they did last year. Meaning that yes, apps have added features, but the core of each app is essentially the same. Still, I’m working to get the tables all updated, so at least the backend data is up to date for this year. I don’t at the moment have plans for forums, but it’s something I’m eyeing how to implement in the new year. I’m trying to avoid a case where I’m basically just expanding the footprint of things I’ve gotta oversee, since time is already pretty pinched as it is (I actually spend the majority of my time on the site these days replying to comments/questions/etc, and not writing new content). Maybe having a yearly review covering all apps is actually too much. What about single reviews for new apps or significant updates? As for the forum, yes I was not thinking about you as a 24/7 moderator, it would not be feasible. I think that overtime you could become what dpreview is for photography! It doesn’t need to be a dcr branded forum, just a link to one forum would be nice to concentrate the discussions somewhere central on the net. Right now the comments section here is the closest thing to that but due to the nature of comments sections threads die quickly. The Garmin forums are great but the vendor ownership limits them. Slow twitch is good but very Tri heavy. Any suggestions welcome to others. Re forums: You could always take the Garmin approach and completely ignore the users. Suunto adopt the same approach, as do Microsoft and Apple. It appears to be an industry standard. Yeah, I would totally recommend just adding a “What’s New for 2015-2016” section to each app in last year’s post and just edit the title to edit out a specific timeframe. Maybe a few would require some new screenshots, e.g. Zwift’s workout creator, but for the most part, new screenshots are not needed. 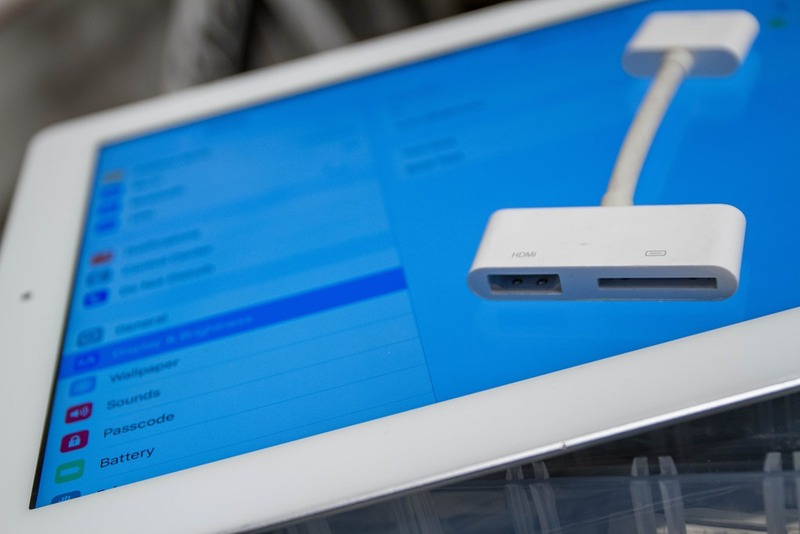 Hi, one problem to mention with the iOS adapter solution is, that you can´t use it with the wahoo ANT+ dongle. It does not seem to get the data through, only useful for the power plug. Good post. If I had this info years ago, I would’ve optimize my expenses on Hi-Fi and wifi devices. 1. When doing the Apple Airplay thing, one should beware that a not-so-good wifi router will drop the wifi connection in the middle of the exercise. Of course that should not interrupt the workout but it will be annoying as hell. To avoid that, search Apple forums for complains about dropped wifi connections during AirPlay and make an idea about how top-of-the-line the wifi equipment should be to avoid having the connection dropped. 2. I didn’t see here a suggestion to connect the iPhone or iPad to a software running on PC (don’t know anything about Macs, sorry), to have the PC act as an AirPlay server. That would in theory help not spending $$$ for an AppleTV, but spend 2-3 times less $$$ for a software program. But in practice you may end up spending the same or more. Why ? I was stupid enough to buy such a software – the name is Reflector. a) Every now and then the connection drops despite my top-of-the-line WiFi equipment. b) When iOS got upgraded from ver.8 to ver.9 in Sept. 2015, it turned out that the Reflector was developed by reverse-engineering the AirPlay protocol, and the iOS 8->9 upgrade changed so many things that the Reflector software did not work any more, and the developers asked me more money for an upgrade of their Reflector software. Now, that software is just a bunch of Mb wasted on my PC, some $$$ down the drain and some nerves. When iOS will be upgraded again, one cannot know what would Apple change in AirPlay again. But when they changed iOS from 8 to 9, they did it in such a way that AirPlay-ing to my AppleTV worked perfectly after the upgrade. So the chances are that the same will be on the next major iOS upgrade. Some TVs have a built-in wifi receiver to which a device may connect wirelessly and mirror its screen. I have a cheap *&^%#$ Android 4.3 device which has a feature named “wireless display”, and my Sony TV has a wireless feature named WiFi Direct. So if I had good fitness software for that Android device, it’d cost me nothing to mirror the device screen on the big screen. I use both wired and wireless options with my MacBook depending on battery charge. Zwift seems to eat up battery going from 100% to 30-20%. I can easily charge while in use but I dont like having to move my charger back and forth. “A brief note on Apple accessories: You’ll want to be semi-careful of purchasing non-Apple branded connectors, simply because sometimes they do wonky things.” That’s an important point, especially with Lightning cables if you use a case to protect your iPhone from sweat/water/impacts/etc. I have a Lifeproof case on my iPhone 6, and only Apple cables will fit. The others (I’ve tried several different brands) all change the size of the plastic surrounding the Lightning connector so that they just won’t fit through the case. They’re too wide. Paul, the Luxtr cable (on Amazon) with also work with with the Lifeproof case. This is true, but I’ll point out that the 4th gen is the first Apple TV to support its App Store. I’ll be curious to see if versions of trainer apps are released for the Apple TV. This eliminates the need for any mirroring, but I wonder if the Apple TV could connect to fitness sensors. I wondered exactly the same thing. I haven’t asked Apple (assumed they wouldn’t answer), but have asked the manufacturer of an Android Box (Zidoo X6 Pro); they have told me that it would not be able to use an ANT USB stick, which is annoying as TrainerRoad are supposed to be releasing an Android App soon & Android boxes are much cheaper. Incidentally, lots of Android boxes can do Airplay, including some Zidoo and Droidbox ones. Pretty sure Reflector-2-For-Android works on Amazon fire stick thingies (the fire thingy is mentioned specifically on their website). If you are not going to use the functionality of an Apple TV for anything else you can pick up something smaller and cheaper. Also, older Macs, like mine, can’t broadcast Airplay, but it works with software like Air Parrot. I use AirPlay from my Mac to my Apple TV. They are in separate rooms so to use Zwift (or any other platform) I needed a ANT+ Dongle and a USB extender. This allows the Mac to pick up my power, cadence, heart rate, etc. Your system sounds very similar to what I want to do this winter. I have Mac Mini in the office and plan to buy the Apple TV for the TV room. Couple of questions… I’ve never used/seen Zwift in action, so how do you “control” the program? What is the USB extender used for? The actual Zwift app runs on your computer, not on your phone. So you need the Ant+ adapter, plugged into your computer, to reach close to your bike or it won’t communicate power and other necessary info. The phone app is purely an accessory to what’s running on your computer but does let you control much of the Zwift user interface. By the way, I have to give Zwift 2 thumbs up. I have never had such high quality indoor rides as with Zwift. It’s addictive! I’ve been through all the trainer apps on iOS that my Tacx smart trainer supports, and settled on Zwift as being the most entertaining (and thereby the one that keeps me working out the longest). I hadn’t thought about AirPlaying it to the Apple TV before (I just bring the computer downstairs). 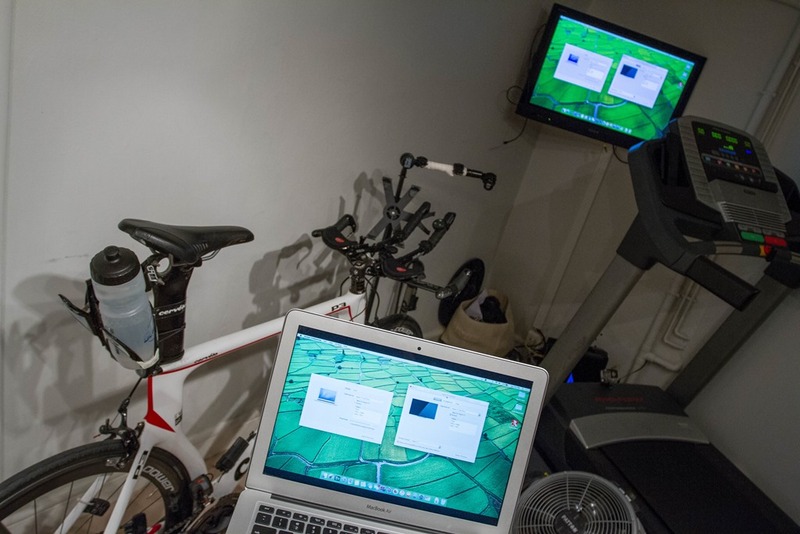 I notice they’ve added BLE support in the mobile app – I guess this uses wi-fi to talk to the zwift app running on the Mac – so eventually I could connect my sensors to the mobile app, have it relayed upstairs and then airPlay the screen back to the Apple TV. I wonder if it’ll be horribly laggy though. I was looking forward to reading the trainer app review also and will still read it after it’s updated, but I recently bought a Wahoo KICKR when they were on sale. I had intended on evaluating TrainerRoad, Zwift, and PerfPro, but ended up buying TrainerRoad and not even evaluating anything else besides the free Wahoo Fitness app and Kinomap Trainer. It’s your site and you’re obviously going to do want you want, but don’t feel like you have to update all of the pictures for all of the apps. Ideally, you should try out all of the apps and give your impressions, but if it’s going to greatly delay the review or eliminate the review in the future, I’d rather you just review what you think are the 5 to 10 best apps and just note for the other 10 to 15 apps that you didn’t review: see the following URL for the manufacturers web site to see what has changed since the previous years review. I agree. That was a massive apps article last year. I’d rather read you select review(s) of what Ray thinks is interesting rather than Ray’s perceiving a burden to exhaustively do new write up on every app. 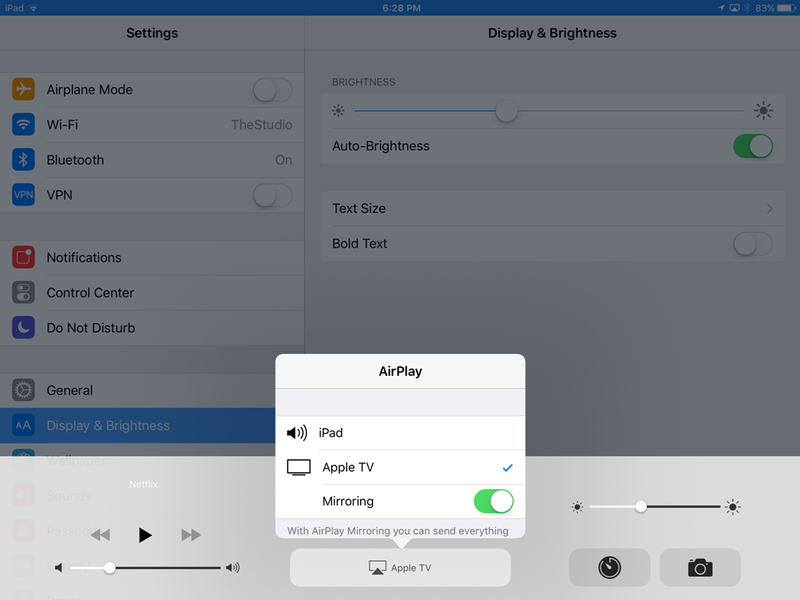 Just a detail about AirPlay – it’s not actually necessary for both devices to be on the same network. You can set up a peer-to-peer connection between your iOS device or Mac and an Apple TV. Some technical requirements: the Apple TV must be 3rd or 4th generation, iOS 8 or later on the device, or OS X Yosemite 10.10 on a Mac. While the more common use case may be the devices on the same network, peer-to-peer has its uses, such as in a presentation scenario. The presenter just needs to bring along his own Apple TV and iOS device or Mac. Hook the Apple TV up to an AV system, and good to go without needing to connect to a network. Interesting – never tried that. Does that then ‘replace’ the existing WiFi network? For example, if you use Kinomap and did a peer to peer, would that break the ability to otherwise stream or connect from the internet concurrently? “Apple Wireless Direct Link” – see here and here. Should not disrupt existing infrastructure Wi-Fi connections. I think Apple Wireless Direct Link (AWDL) is something different. This is just a peer-to-peer connection between an iOS device or a Mac and an Apple TV for AirPlay. The answer to Ray’s question is that it does not break the ability to concurrently access content from the internet. As in, yes you can access content from the internet using your iOS device or Mac and display it on the Apple TV with a peer-to-peer connection. But with a qualification to that answer: it works for static content such as websites, but it doesn’t work for video, either by AirPlay or AirPlay Mirroring. Great article. One comment regarding Macbook Pros – they have an integrated HDMI port since the introduction of the 2012 “Retina” (high resolution display) model. Therefore for my 15″ 2012 Macbook Pro Retina all I need is an HDMI cable between laptop and TV. 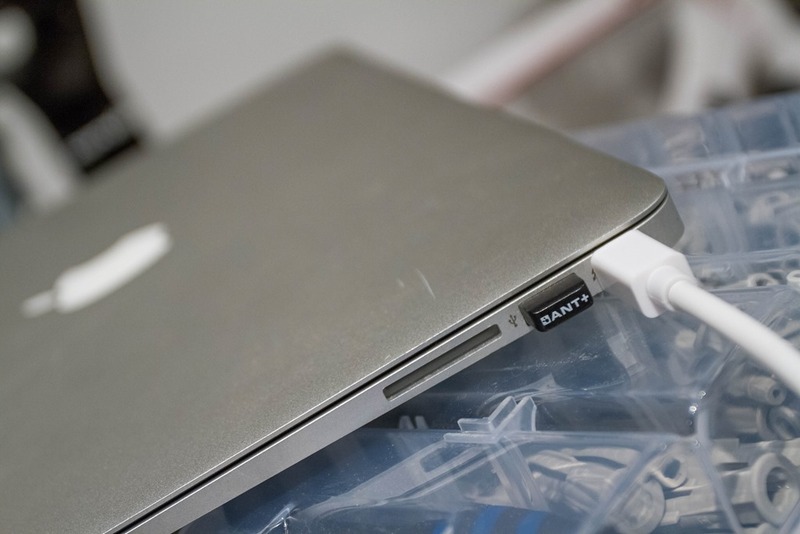 The other MacBooks – Macbook Air, the super thin Macbook with single USB-C port, and older Macbook Pros (non-retina) – require an adapter. Good point. I had thought about that, but then figured if it didn’t need an adapter I didn’t need to note it – but definitely valid since I note it everywhere else. Just added in. 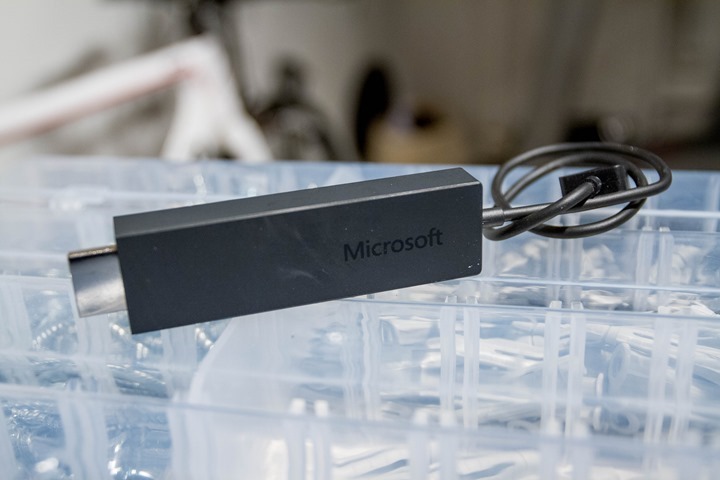 Just FYI, with the Surface 3, the entire Surface line, regular and Pro use Mini DisplayPort. I personally prefer wired. Reason: (almost or) no lag in the display. 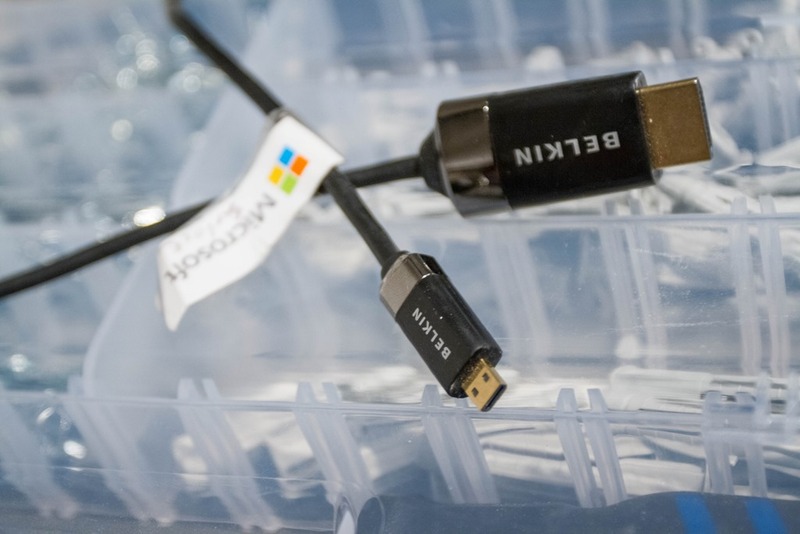 I used Chromecast (old dongle) and Microsoft Miracast with my Android device: Chromecast has the poorest performance, Miracast is actually a wireless HDMI connection with some lag; but not that much. What I noticed using the Tacx app: the power consumption from wireless streaming and app: it draws almost all the power and my tablet started to complain about lack of power (fully charged and plugged in!). Asus TF103C transformer and the Ant+ dongle in the keyboard, power in the micro usb slot of the tablet. This will vary per tablet, but be ware that a tablet has to work hard for wireless streaming. Today I only use my relatively new gaming laptop for Zwift and the PC Tacx software and all wired up (laptop is next to an old 20″ monitor). Chromecast has an experimental mode that will cast the full windows desktop to the TV. I have not used this in anger but have verified that it does work from my windows 10 laptop. I got tired of moving my computer downstairs to ride Zwift and found that I could project the screen and sound from my PC upstairs to my Roku Streaming Stick+ 3810RW device downstairs. So far it seems to be working perfectly with little lag. I use BLE on my Android phone with the Zwift mobile link app to pick up the sensor data from the Wahoo Kickr Snap. I bought the Roku initially to get an app not supported by my TV yet, and was pleasantly surprised to discover this functionality with Zwift also. In my case I am looking to turn this on its head. I am not allowed my trainer in the living room so I am not in front of the big screen. I am currently using the Tacx iPad mount with the trainer road iPad app. It works great. However I would really like to give Zwift a go. They have no plans for an iPad app as strangely they deem it not to be powerful enough. Do you know of a way to “cast” my windows 10 laptop screen to my iPad Air 2? 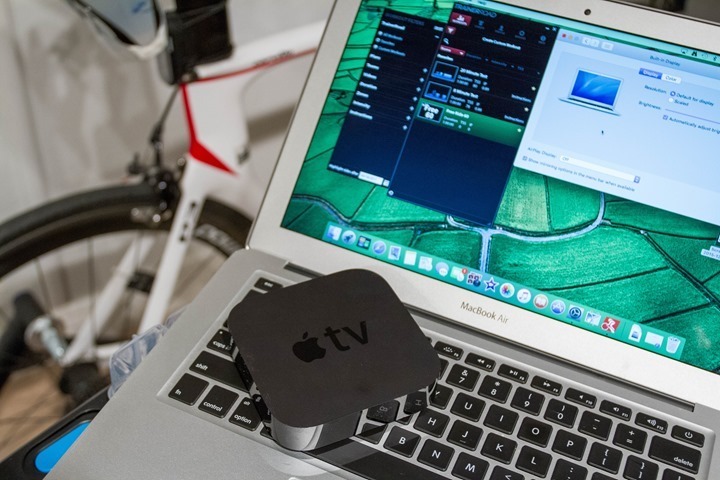 For those of you who have an ios device and a Windows PC or MAC and do not want to spend the money on an Apple TV, Airserver is a great option for mirroring iOS devices to your TV assuming you have the cable to connect your windows PC to your TV. Good article, recently bought a tacx and have used Apple TV to mirror zwift from Mac. I find it’s a bit laggy so bought a thunderbolt to hdmi adapter the other day and plan to connect Mac and tv to improve things. I’m sure there is a solution to the lag on AirPlay but thought wired may be easier than messing about with wifi network / router. Great timing for this post as I hunker down with YouTube videos for trainer sessions. I don’t have a controllable trainer so just recording data on the Garmin for analysis (or not). What surprises me is the first and primary streaming device — Roku — has not added this functionality. You can stream media and photos but not simply mirror the display. Looks like time to check out Apply TV! Roku will mirror android screen. What’s the best option for watching Netflix in a hotel room? I read that roku, chrome cast, and fire all don’t allow connection to hotel internet as they don’t have web browser to agree to terms. If anyone knows of a good way to wirelessly transmit Ant+ signals to a PC in another room, I would love to know about it. I would like to give Zwift a go, but my only PC capable of running it is in the office upstairs while my trainer and TV are in the basement. Depending on the length of the cable run, you could use a USB extension cable and just have the ANT+ dongle in the basement. If your office is directly above your trainer, it would not be that far. I’ve used USB over Cat5 extenders @100′, never tried an Ant+ stick but should work. I think those extenders only work with USB 1.0 and not 2.0 which is required by Zwift. Also, when purchasing Apple accessories on Amazon, it’s important you purchase them from Amazon proper, or a highly reputable third-party seller. While it is a genuine Apple cable sold by Amazon, it might be a generic non-functional piece of scrap from third-party seller PromiseGoodDeal4U. The user reviews don’t differentiate between sellers, and not all are selling the same genuine quality product. iphones and ipads have not used 30 pin connectors in quite some time. do you have experience with the 8 pin to hdmi connector? i believe there is such a thing for current iphones and ipads. thanks. I bought one when I got my new car with a rear seat entertainment center with an HDMI input. It works quite well, and it’s essentially the same as the 30 pin version Ray shows above. On one end is a Lightning connector, and on the other an HDMI port and a female Lightning port, so you can power your iWhatever while you mirror it’s screen on the HDMI screen. I can’t vouch for the quality, because I’ve just showed the (Retina) screen on my iPad mini on the slightly larger swing-down screen in the car, but it works fine. One note about the wireless comment: “…you’ll need to obviously be on the same network for this to work (i.e. same WiFi network)”: These streaming systems typically only work if the device (phone, tablet, laptop, etc) is on the same “subnet” as the streaming device (Apple TV, Chromecast, etc). In simple consumer/residential WiFi setup, this is almost always true so they work great in those environments. However, on a commercial or enterprise wireless setup, devices are often randomly placed on different subnets, so these systems will usually NOT work in these environments. I work in a university and these devices do not work on our WiFi for this reason. They also usually can’t negotiate wireless systems that require a sign-in web page, such as you would find in a hotel. Just wanted to let readers know. FYI…on new android devices like nexus 6p they don’t have Any hdmi out functionality. However, the newer android 6.0 has cast functionality to newer tvs that use miracast. Thoughts on advantages/disadvantages of wireless versus wired? I’ve heard that either can handle the video, but there is a reduction in lag with wired. True? Wired is always better if you don’t mind the wire mess. Wireless is simply a convenience; it isn’t as fast or reliable as good ‘old cables. If you can hard-wire your PC to your Internet router and your TV, that would be the fastest and most reliable way to connect everything. I have a flat plate on top of a photography tripod. That’s where I stick my Mac laptop. It’s a big enough screen that I don’t really care about getting it to the TV. I have a Nexus 7 tablet and Nexus 5x phone. Both have a “Cast” feature built into Android and I’m able to send whatever is on the device to a TV using an app on my Roku boxes. So I guess that would work for any trainer apps available as Android apps? Correct? I haven’t yet decided on a trainer, but most probably will be Kickr or Kickr SNAP. I’m interested in Zwift and TrainerRoad at this point. I THINK Zwift requires a PC (no Android app) and I’m not sure about Trainer Road though. I’m thinking of using a spare laptop, ANT+ dongle and one of your suggestions for getting to the TV. Most phones and tablets don’t have enough “horsepower” to run a graphics-intensive application like Zwift, much less wirelessly broadcast the display to a TV. You can try it, but I think you’ll be disappointed. Also note that the Zwift application that you download via the Google Play store isn’t the application that you connect to your trainer that displays the video, it’s simply a controller app you use to send IM messages other riders, display rider info, etc. You must download the actual core Zwift application from their web site and I don’t think it’ll even install on your tablet or phone. You’ll likely want an actual PC or high-end tablet (like a Microsoft Surface) if you intend to use a training tool that features video. 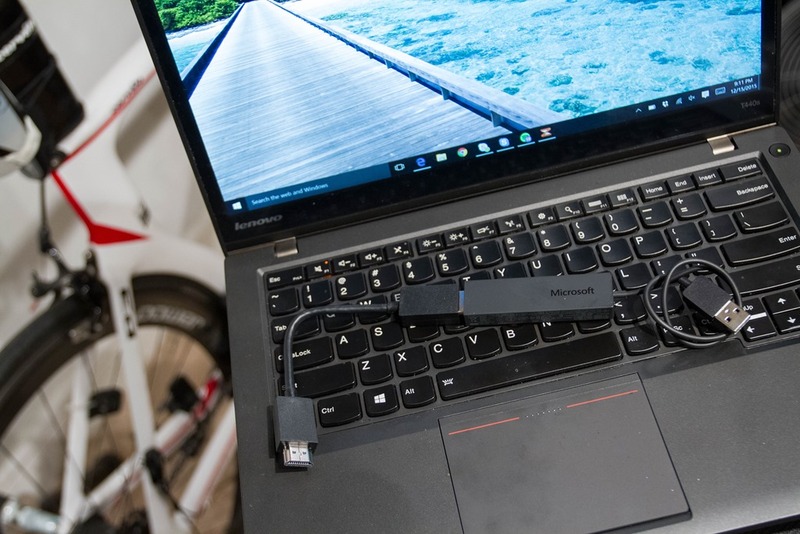 I have a Wahoo Kickr and use Zwift, but I have a fairly expensive laptop (Lenovo ThinkPad W510) with a dedicated graphics card and it nearly starts blowing fire out of the events after a long ride (well, not fire… but it’s very hot). My laptop’s on-board graphics card can’t handle Zwift… I accidentally had my laptop configured incorrectly to use my laptop’s onboard graphics processor and Zwift would lock-up about 2/3 of the way through my rides. Zwift is PC or Mac only. For some reason they have chosen to do the graphics client side and hugely reduce their target audience. No Android yet for TR. Zwift in the past has talked about why they started with PC/Mac first – which was simply that it started within the computer gaming world, and the graphics required it. They’ve also said they plan to eventually get to tablets. But realistically, anyone in their target audience has a laptop/desktop/etc around them somewhere, even an old one. Remember, the Chromecast now looks like a small hockey puck and potentially colourful! Maybe it’s just me but I find Apple TV struggles to stream Zwift when I’m running it in ultra res into my 4K screen (from a MacBook Pro). I’ve gone back to a wired connection as a consequence. Just poor wifi infra on my end or an Apple TV contrainst? This question betrays my total inexperience: I see there are multiple ways to get something from a device or PC to a big screen, BUT, how much (if any) interaction is there between the user and the application during use? Seems like another can of worms. Just to be clear, question is “How do you “talk” to the app during a session? At least as far as AirPlay, you interact with and use an app in the usual way. It just mirrors the device’s display to the Apple TV. sorry for being mostly OT with this question, but does anyone know how to do the same with just audio? I’m Windows based and I already can stream wireless audio and music files to mi hi-fi, but only if they’re stored somewhere on a hard drive. I’d like to do the same with all the “sounds”of my pc, being them spotify playlists or so. And now, totally Ot: Merry Xmas everyone!! I tried going the wireless route, but found the lag and delay was too much to try and overcome especially when dealing with workouts where almost instantaneous feedback is necessary. Just my experience and your mileage will vary. This is a great article and nice to read about other folks experiences. Looking forward to trying this with the new Sufferfest app on my iPhone or iPad. I expect it will work identically to the other apps I stream via AirPlay. 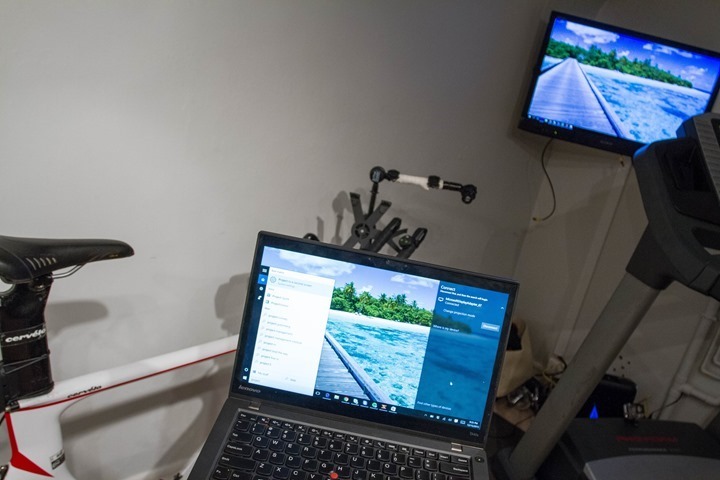 Any thoughts on making your own video of a bike course with an Garmin Edge 520 and GoPro or Garmin Virb Elite or XE for importing to PerfPro Studio? It’s funny, I wrote up an entire post about 2 years ago on this. Increda-detailed. And then never quite finished. Sadly, it’s now outdated. I need to write it again. Good reminder! Good news, looking forward to reading it. So I want to use a TV or a monitor for Zwift. I see how to follow things from the blog post, but I am still confused as to issues between a HDTV and a monitor? Either way thinking in the 30 inch range. Other pieces are Mac Book Pro i7 and Nvidia 650 card 16GB mem. Tacx Neo Smart. Ive just installed Zwift on both my iPhone and iPad. When I airplay Zwift from my iPad via the Apple TV to the TV, the TV screen has borders on both sides, rather than filling the screen. Is this because the aspect ratio on an iPad is 4:3 and most widescreen TVs are 16:9? Im wondering if theres a work-around. GPlama has noticed this too, maybe in future Zwift iOS release it will be solved. So far it is normal behaviour. The problem I found when using a laptop and Apple TV connection was having the laptop go to sleep. Obviously you can change your settings in system preferences but this is a pain as you have to remember to change it back after. There’s a few apps on the Mac that can help but I chose Amphetamine (link to macupdate.com) which you can then use to keep the Mac awake and display on for an hour or so. Will Steam Link work? 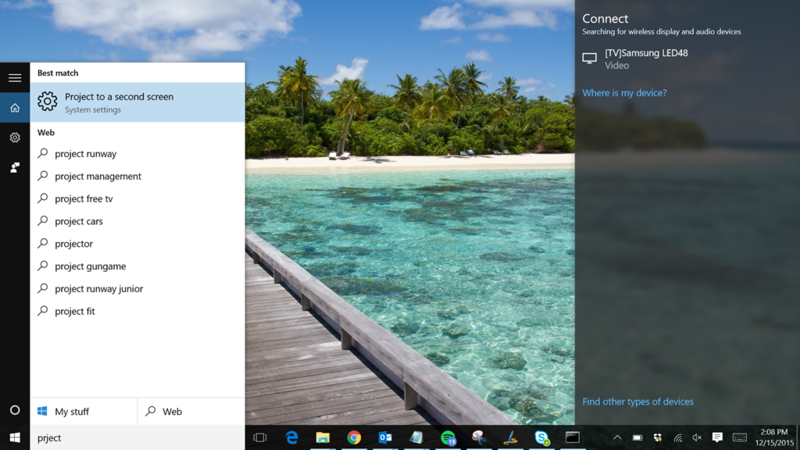 How does it compare to Miracast for lag? I use a SteamLink with Zwift. Works great. I use my phone running Zwift Companion to provide the Bluetooth connection between Zwift and the turbo trainer. Can I download the Elite E-trainer app to Amazon fire stick or to Apple TV and thus directly displaying it onto Samsung smart TV without use of phone, laptop? Thanks! Would like to enjoy ad-free DC Rainmaker. Hi DC, I recently upgraded my TV for Zwift and tried connecting Zwift app to smart TV via HDMI. It is visible but is in portrait mode even when showing in landscape mode on app when phone screen is unlocked. Therefore the screen shows the app at 90 degrees to horizontal. Very weird! I have toggled through all screen settings but makes no difference. I have tied same on my iPad and it works perfectly albeit with 3:4 screen width restriction. I am trying to get full screen 16:9 benefits from my iPhone. Any ideas ? Thanks in advance.